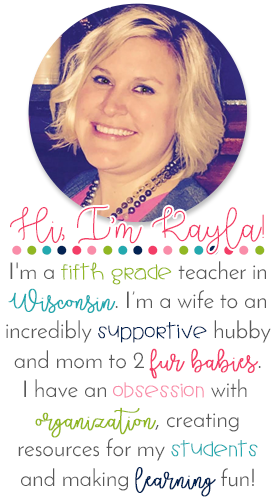 I found this idea on Pinterest a few years ago and have truly LOVED this procedure in my classroom. 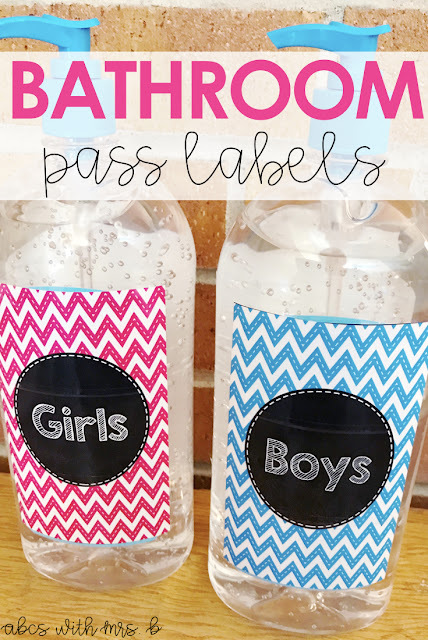 I was never really a fan of bathroom passes leaving my classroom and going with the students to the bathroom (in my school a hall pass is not required). I often had a missing bathroom pass because a student forgot it in there. AND I really didn't 100% believe students were being overly sanitary...yikes. Here is how the bathroom procedure goes in my classroom: hand sanitizer bottles! Before school starts, I buy two large hand sanitizer bottles - one for girls and one for boys. You can grab the labels HERE for FREE! 1. Discuss appropriate times for students to use the bathroom right away on the first day of school. I am fine with them going during all independent work periods, but not during whole group instruction or if they are in a small group with me. 2. When the student needs to go to the bathroom, grab their bottle and put it in on their desk. This gives me a quick look at who is in the bathroom at any given time. 3. Student goes to the bathroom. 4. When the student returns, they pump some hand sanitizer (I tell them this is IN ADDITION to washing their hands) and put the hand sanitizer back in the appropriate location. EASY PEASY! What is your bathroom procedure in your classroom? Teach those students to structure! It's a bit surprising how many students even in upper grades don't have these skills. Once these skills are solid, student understanding of deeper material will be much more fluid! Here is a roundup of all the ways I guide my students to structuring numbers to 10! These activities can easily be adjusting to 5s and 20s. Now, here are a couple ways you can quickly and easily use each of these materials. There are so many varieties that you'll be set for lessons! Quickly flash one of the materials at the students - they should see it for approximately one second. Then turn it back over and ask the students the following questions. How many on the top? How many on the bottom? How many altogether? How many to make 10? Students can also practice this activity with a partner. One partner flashes and the other responds. You can do this with any of the materials listed above giving you so many days of small group lessons! Flash a material like above. Students will then write the number on a whiteboard. You could also have students write the pair to make 10 or have them write a number model that represents the material. Show students a material. Ask them what the students see and how they see it. Students start to build great conversations around combinations of numbers. Check out Sherry Parrish's Number Talks book. It is AMAZING and so worth it! Show a bead rack or counters and screen a portion of it. Students will then have to work out a solution while transferring to mental math strategies. This works really great for the rekenreks. Show an amount, say 3, and keep the remaining 7 screened. Students will have to figure out how many are missing. Give students a material to work with. Ask them to construct a number. Watch and observe how students construct that number. Then ask them to construct another. Observe how they manipulate their setting - do they clear the setting completely or simply adjust it? You can build strong math talk around this as well by having students describe their setting to each other, what they see and notice, as well as how they adjusted their setting. Give students addition and subtraction problems where they can use their setting to manipulate the beads or counters. This will give students a more concrete representation and students will start to notice they can use 5s and 10s as anchors. 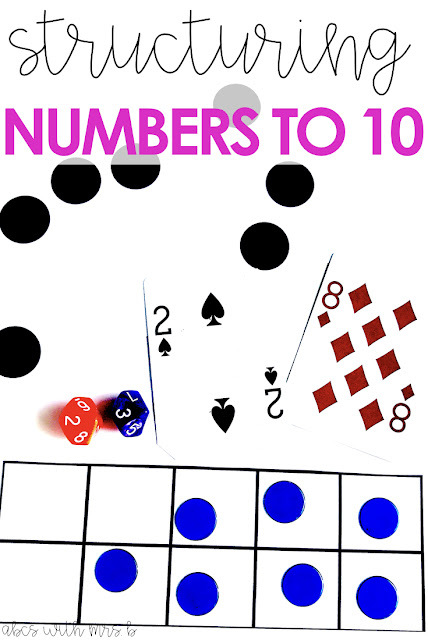 Games such as Make 10 Go Fish and Make 10 Memory with a deck of cards are super engaging for students. You can also find some engaging Bingo and Race games HERE. I also snagged this Shut the Box game on Amazon HERE that my students absolutely LOVE! How do you teach structuring in your classroom? The best part is all of these activities can easily be adjusted for structuring numbers to 5 or 20! You can check out another blog post I wrote HERE about some of the ways you can specifically use ten frames in your instruction!